On May 15th this year the Claude Pepper Library will turn 30! Throughout this month and the rest of the year, the team at the Claude Pepper Library will be providing some history and context about the library and its namesake. 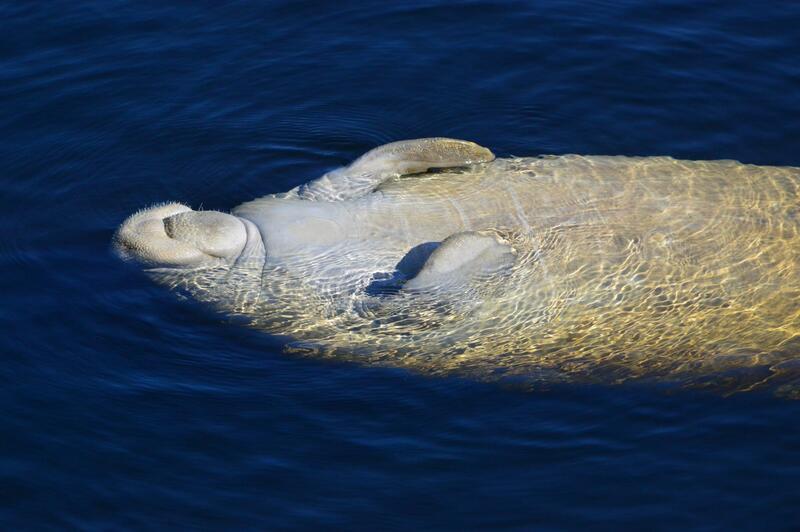 “For more than six decades, Florida has been my home. [i]” That’s how Claude Pepper began the second chapter of his 1987 autobiography, Pepper: Eyewitness to a Century. Claude Denson Pepper loved the State of Florida and many of its lively cities, one of those cities he loved was Tallahassee. 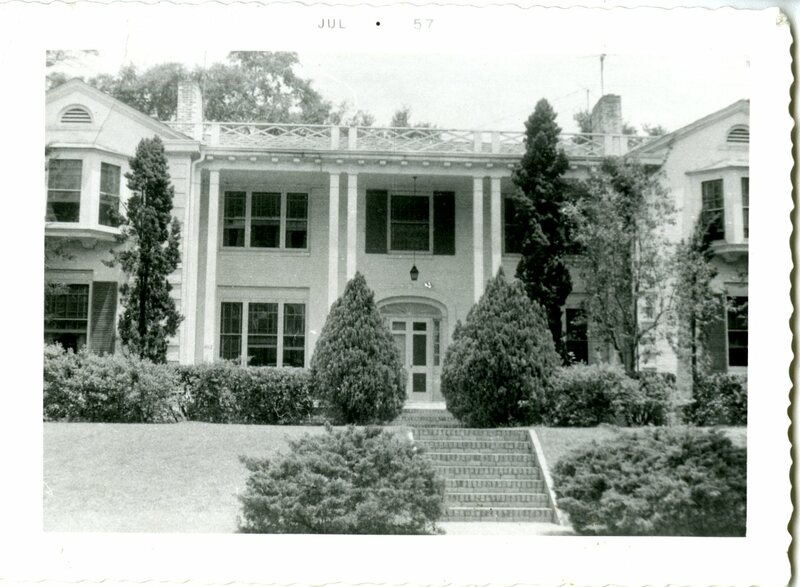 The Pepper’s family home in Tallahassee, July 1957. Claude Pepper was born in Camp Hill, Alabama in 1900. Though Claude lived an adventurous life where he was constantly working and traveling, he and his wife, Mildred, chose to build a life in Tallahassee for a period of time. Claude graduated from the Harvard Law School in 1924 and began practicing law in 1925 after he was admitted to the Florida Bar. He practiced civil and criminal law at a law practice in Perry, Florida and from 1929 to 1930, Claude served as an elected member of the Florida House of Representatives, representing Taylor County. Claude spent a lot of time going back and forth between Perry and Tallahassee during this time in his life. He served as a chairman for the Committee on Constitutional Amendments and was a member on a number of committees. It was his stand against another Florida representative that led to his defeat for re-election in 1930. It was after Claude’s defeat in 1930 that propelled him to move to Tallahassee. 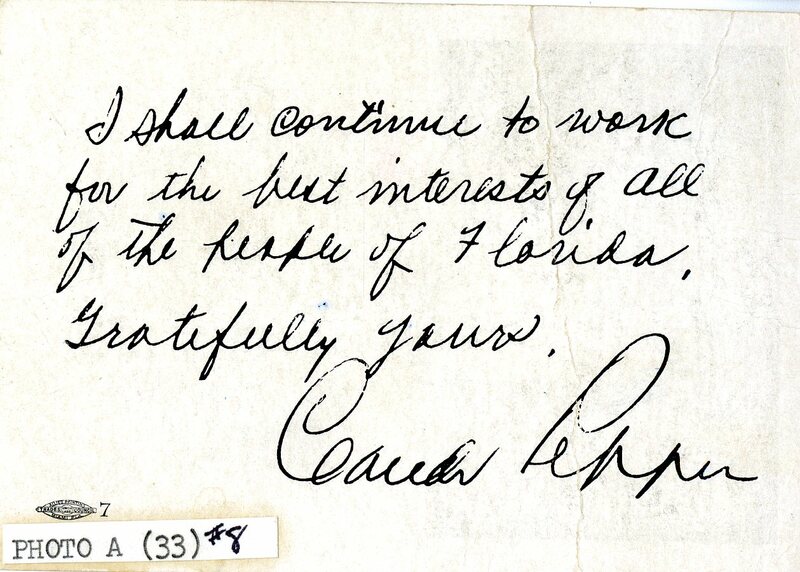 Claude was urged to continue his political path after his 1930 Florida House of Representatives loss by Judge W.B. Davis who told Claude that he needed a, “more visible stage (in) either Tallahassee or Miami. [ii]” Claude was advised by others to move to Tallahassee as well. 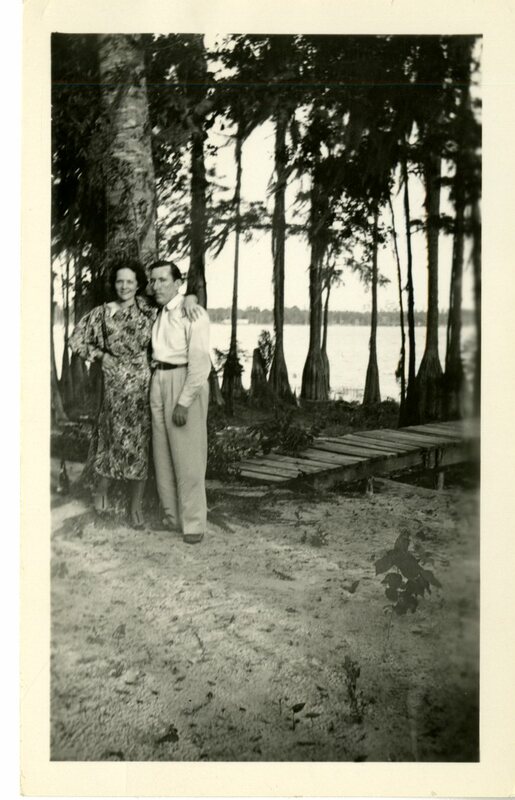 Mildred and Claude Pepper at Lake Bradford, 1940.
law office with law partner Curtis Waller. Claude also served on the State Board of Public Welfare. It was around this time he was introduced to Mildred Webster. Claude was stunned by a woman in a “bright yellow dress” leaving the governor’s office, “why that’s the prettiest girl I’ve ever seen[iv]” Claude said to himself before he was introduced to Irene Mildred Webster. She lived in St. Petersburg but was in Tallahassee at the time working for the state legislature. They dated on and off for a period of five years. Mildred helped Claude kicked off a primary senate campaign against then sitting U.S. Senator Park Trammell in 1934 while living in Tallahassee, but he lost the primary in a close election. Nearly two years later in 1936 both U.S. Senators representing Florida died, Park Trammell in early 1936 and then five weeks later Duncan Fletcher died. Claude filed to run for Senator Fletcher’s seat and no one filed to run against him. 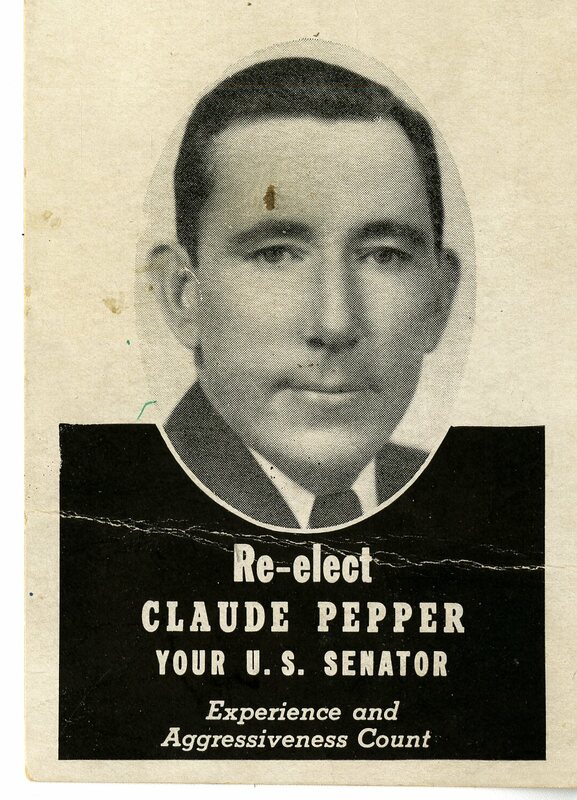 Claude Pepper ran unopposed in the 1936 election and became U.S. Senator Pepper. It was also at the end of this year on December 29, 1936 that Claude and Mildred were married. Through his U.S. Senate service (1936-1950) Claude and Mildred kept residences in both Tallahassee and Washington, D.C.
Tallahassee with his law partner and friend Jim Clements. Things were a bit shaky at this point, especially with the law offices in Tallahassee, but Claude stayed close to politics and regularly visited Florida State University to talk with loyal supporters, including the student body president at the time, Reubin Askew. On March 2, 1951 Claude’s law partner and longtime friend, Jim Clements died. Claude’s mother, Lena Pepper and other family members were still living in Tallahassee, but around the mid-1950s Claude and Mildred were going back and forth between all of the law offices between Florida and Washington, D.C.
Claude campaigned for the U.S. Senate again in 1958 for the Republican Senate seat that belonged to Spessard Holland, but Holland won his re-election. The good news that came out of that election for Claude would be that he carried Dade County by 25,000 votes and that weighed in on his decision to run for the U.S. House of Representatives representing a new district in Florida. Claude won that campaign and served his district and country as a U.S. Congressman for the rest of his life. Claude and Mildred Pepper maintained their close friendships and relationships in Tallahassee during this time. In January 1979, Mildred and Claude attended the Inauguration of Governor Bob Graham. 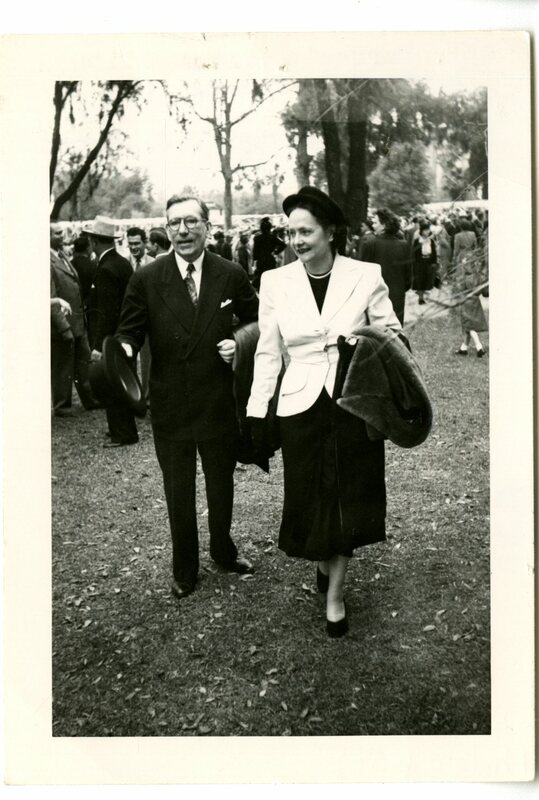 At this time plans were established to build a library dedicated to the life of Mildred and Claude Pepper at Florida State University. Mildred Pepper died from cancer on March 3, 1979. Claude held two funerals for his beloved wife, one at the Coral Gables Methodist Church in Miami and the other at the First Baptist Church where she and Claude worshiped while living in Tallahassee. Claude remained active and vigilante while serving in the U.S. Congress. The Mildred and Claude Pepper Library opened here at Florida State University on May 15, 1985. The original library was located in Dodd Hall and moved to Call Street in 1997. Claude Pepper lived an ambitious and productive life of 89 years where he worked hard and accomplished many great things. We’re honored that he chose to spend an exceptional amount of time carrying out that work in Tallahassee. During the third week of the fall semester the History Department here at Florida State University threw a meet and greet for their students and professors. 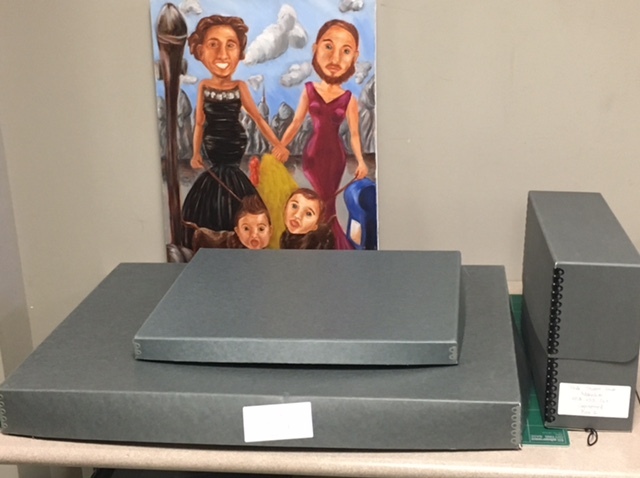 The Special Collections & Archives Department was asked go through some of their collections and make up some displays for this meet and greet. Here at the Claude Pepper Library we decided to put some items from the 1950 primary election in one of our displays. I was tasked with finding items for the 1950 election display and boy did I discover some interesting items in our collection! The 1950 primary election was between the incumbent Florida Senator Claude Pepper and U.S. House of Representatives Congressman George Smathers. This primary election between the two Florida Democrats was one of the dirtiest political races in U.S. history. There were three major issues facing Sen. Pepper at the time of his re-election. The first issue was Sen. Pepper’s support for America maintaining a peaceful relationship with Russia at the end of WWII. The second issue was for Sen. Pepper’s legislation and support for the National Health Insurance Act of 1949. The third issue for the senator was his support for many of President Franklin D. Roosevelt’s legislation, including the controversial Fair Employment Practices Commission (FEPC). Sen. Pepper’s support for these three issues only hurt him in the 1950 primary election against George Smathers. When the primary was over and all the ballots were counted, Rep. Smathers defeated Sen. Pepper to become Florida’s newest senator. Smathers ran one of the nastiest smear campaigns in Florida’s history against Claude Pepper. Pepper’s nickname from his opposition during the campaign was “Red Pepper” due to his visit to Russia and meeting with Communist Leader Joseph Stalin. Sen. Pepper advocated for America to keep our relationship with Russia open in order to prevent WWIII. Sen. Pepper also supported (though he denied this during his re-election campaign) the FEPC which was also used against him in the primary. Negative of news article from 1950 Senate campaign. The interesting find I discovered while going through the wealth of information we have on the 1950 election was an article in the Richmond Times Dispatch after the election was over. 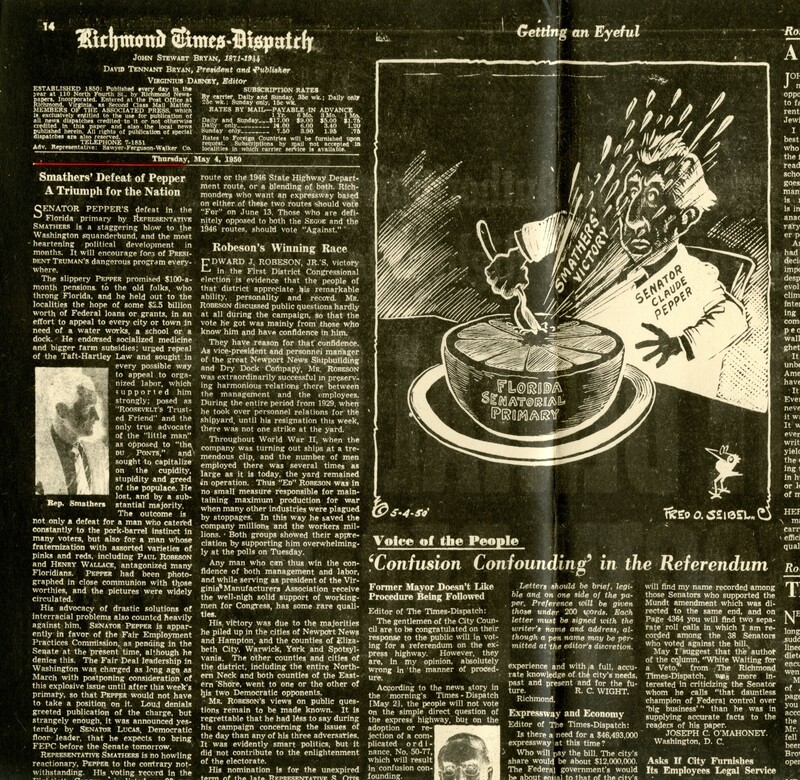 Titled, “Smathers’ Defeat of Pepper – A Triumph for the Nation” is dated May 4, 1950; the article gives a brief summary of the election and the issues that affected the outcome of the election. The issues covered in the article are the FEPC, Sen. Pepper’s and Rep. Smathers’ voting record and the change the Richmond Times Dispatch believed was taking place in Washington, D.C. Rep. Smathers ran as the opposite of Sen. Pepper and his alarm over what was taking place in Washington, D.C.
Discovering the changes in American attitudes towards different topics that were relevant during Claude Pepper’s lifetime is always fun and interesting to us here at the Claude Pepper Library. To find out more information about the 1950 primary election or about Claude Pepper come visit us at the Claude Pepper Library. Mallary Rawls is an archives assistant at the Claude Pepper Library.